Largely complete MUH collection from 1957 2/- Map to 2014 Era of the Husky set mainly on Seven Seas Hingeless pages in binder with slipcase. 1966 Definitive set MLH. Face Value of Decimal issues $172.00. Largely complete MUH collection from 1958 QEII Definitive set to 2002 Birds set in Lindner Hingeless album. Several duplicates and early issues MLH. Face value of MUH stamps from 1971 onwards $288.00. Largely complete MUH collection from 1963 QEII Definitive set to 2000 Crabs set in Lindner Hingeless album. 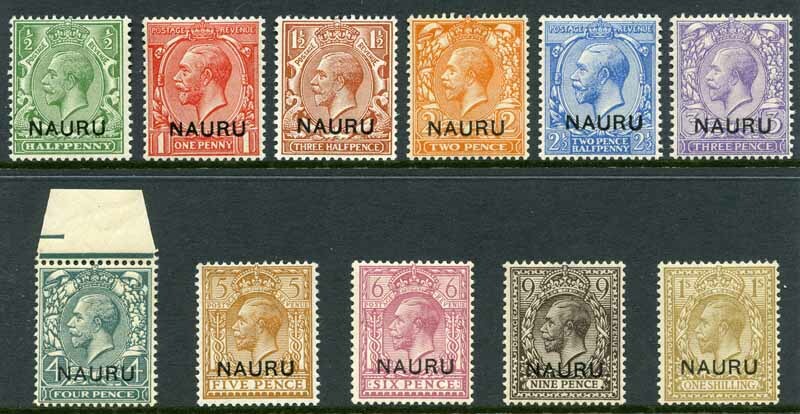 1963 Definitive set MLH and excludes 1990-91 Provisional overprints set. Several duplicates. Face value from 1969 onwards $257.00. 1916-23 KGV O/P at base set of 11 MLH. 1/- value MUH. Sg 1-4 and 6-12. Complete MUH collection from 1968 Definitive set to 1998 First Contact set in Lindner Hingeless album. Several duplicates and odd early issue MLH. Face value $232.00. Accumulation of MUH Decimal issues from 1966 to 1997, including numerous sets and miniature sheets with varying duplication. Face Value $729.00. Largely complete MUH collection from 1947 Ball Bay set to 1989 Christmas set in Seven Seas Hingeless album and two Lighthouse stockbooks, including small range of Christmas Island, Cocos (Keeling) Islands, Nauru and Papua New Guinea issues. Odd early item MLH or FU and some duplication. Face value of MUH Decimal issues $511.00 and K35.00. Largely complete MUH collection from 1966 Definitive set to 2011 Christmas set in Lindner Hingeless album and Seven Seas Hingeless album in 2 binders with slipcases. 1966 Definite set to 1970 Cook set MLH and majority of issues from 2001 onwards with additional gutter pair sets. Face Value $1,483.00. 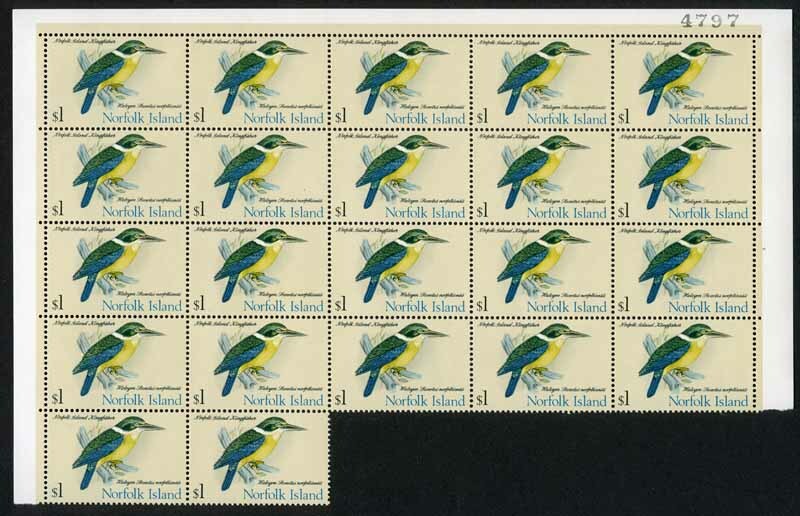 1970-71 Bird set in MUH blocks of 22. Selection of MUH sets and miniature sheets from 1997 to 2007. Face Value $290.65. Largely complete FU collections of Christmas Island from 1958 QEII Definitive set to 1984 Cricket set, Cocos (Keeling) Islands from 1963 Definitive set to 1984 Ausipex M/S, Nauru from 1935 Silver Jubilee set to 1984 Butterflies set and Norfolk Island from 1947-59 Ball Bay set of 14 to 1984 Centenary of Rev. George Nobbs set. Also Christmas Island and Cocos (Keeling) Island (Australia) range of issues from 1993 to 2001 CTO with gum. Few early items with toning blemishes. Christmas Island MUH collection from 1958 QEII Definitive set (MLH) to 1984 Fungi set and Cocos (Keeling) Island MUH collection from 1963 Definitive set (MLH) to 1987 Sailing Craft strip, including some duplication in Hagner album. Face Value of Decimal issues $341.00. Christmas Island, Cocos (Keeling) Islands, Nauru, Norfolk Island and Papua New Guinea collection of MUH, MLH and fine used stamps from 1947 to 1994, plus Great Britain collection of mostly fine used stamps from 1973 to 1996 and a small range of MUH New Zealand issues in 3 large quality Lighthouse stockbooks. Includes many handy early issues, numerous sets and some duplication. Christmas Island, Cocos (Keeling) Islands and Norfolk Island accumulation of MUH stamps and some miniature sheets from 1966 to 2003 (Face value $841.00) and Papua New Guinea from 1966 to 1995 (Face value K652.00). Includes numerous sets and varying duplication. Accumulation of many hundreds of MUH, MLH and fine used stamps from early to modern including many sets and varying duplication on Hagner and Lighthouse pages in binder. Accumulation of MUH stamps, miniature sheets and several booklets from 1965 to 1986 comprising Christmas Island, Cocos (Keeling) Islands, Nauru and Norfolk Island (Face value $196.00), Papua New Guinea (Face value K106.00) and Cook Islands, Fiji, Samoa and Solomon Islands (Face value $95.00). Includes numerous sets and some duplication. Collection of MUH Christmas Island, Cocos (Keeling) Islands, Nauru and Norfolk Island (Face value $899.00), Papua New Guinea (Face value K259.00) and Fiji and Samoa (Face value $727.00) from 1966 to 1995 including numerous sets and miniature sheets in 7 stockbooks. Odd duplicate.